We were thrilled by the response to the announcement of Beyond and the news that the game will be coming to VR. Bringing a game like No Man’s Sky to VR is a colossal technical undertaking, requiring major improvements to and optimisation of our engine. Your enthusiasm and excitement means so much to us as push on with this difficult task, and we will share more as soon as we are able. In the meantime, we have some news for players on PC. As part of our optimisation work, we have added Vulkan support to the game. We have been able to do this not only for Beyond, but for the current live version of the game. As such, we wanted to release this to you as soon as possible. It’s already been a very busy month for us! Today we are releasing a new update for No Man’s Sky, which includes a new Community Research mission, more customisable flora for your base, a terrarium, a striking new Gek-inspired helmet, and a number of minor gameplay fixes and improvements. More on that below. You may also have heard that last week we announced The Last Campfire – an adventure about a search for meaning and a way home, developed by a tiny subset of our small team. We’re yet to announce platforms, but the game is available to wishlist on Steam now. It’s now been a week since we released Visions, and we’re so happy to see players discovering and enjoying the new colour palettes, exotic landscapes, flora and fauna, and new rare items and curiosities to collect! 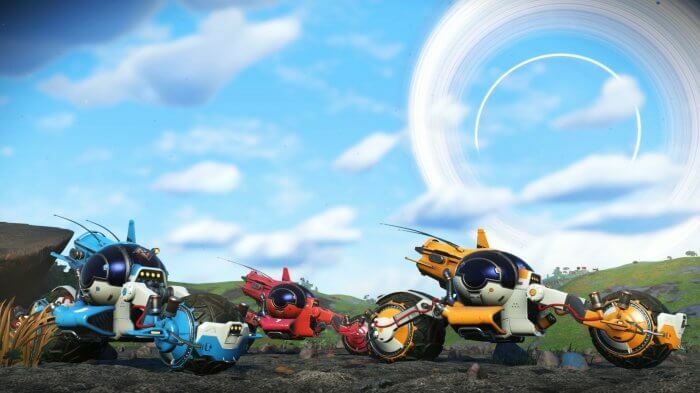 We think we’ve succeeded in enhancing the sci-fi aesthetic of No Man’s Sky, and making the universe a little bit stranger – something we hope to continue doing in the future. Today, we are releasing a patch to address a few gameplay and stability issues. We also wanted to write a small development update to highlight some community activity and reflect on the status of the ongoing two-week research mission. Thank you so much for the positive response to The Abyss update for No Man’s Sky, released only a few days ago. 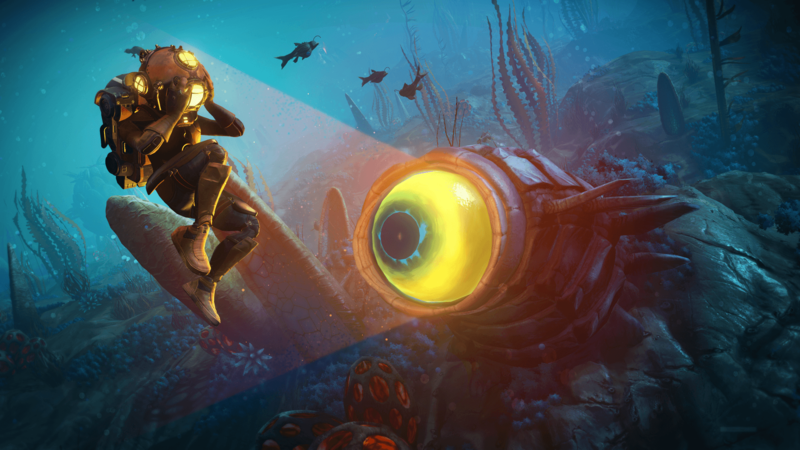 We’ve really enjoyed seeing players experiment with the new base parts, explore the enhanced aquatic environments in the Nautilon submarine, and share their close encounters with fearsome underwater predators. The team here is keeping up the pace this week with another update, patching up a few issues and introducing the next Community Research mission. This week, Priest Entity Nada is reaching out to explorers for assistance with Polo’s research missions. Their Gek friend, rattled by the events revisited by the time-altering device, has fallen into an introspective mood, and appears to have withdrawn from the project. Nada intends to act fast to overcome this – with help from their traveller friends across the galaxies. Two years ago we tentatively announced Foundation, our first update for No Man’s Sky, after an intense launch period. We had no idea what to expect. Foundation started us down a new road, and two years later we’re releasing community missions, dropping weekly content, and NEXT – our biggest update yet – continues to see AAA player numbers. We’ve been overwhelmed by the response. 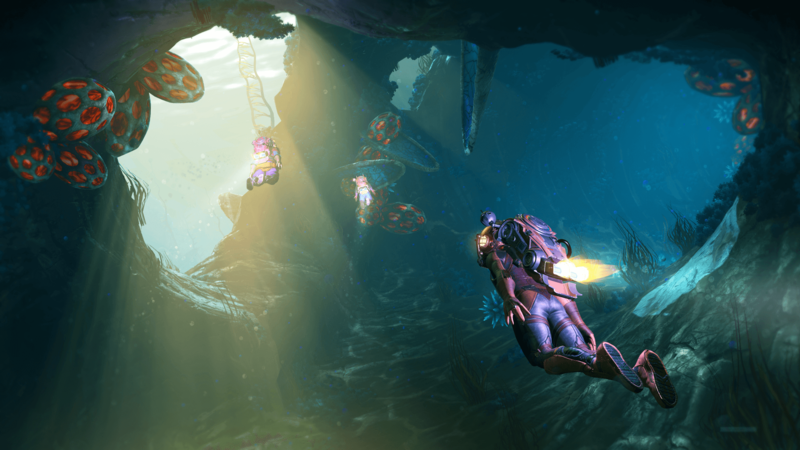 The Abyss launches for free on all platforms today, an eerie underwater update. 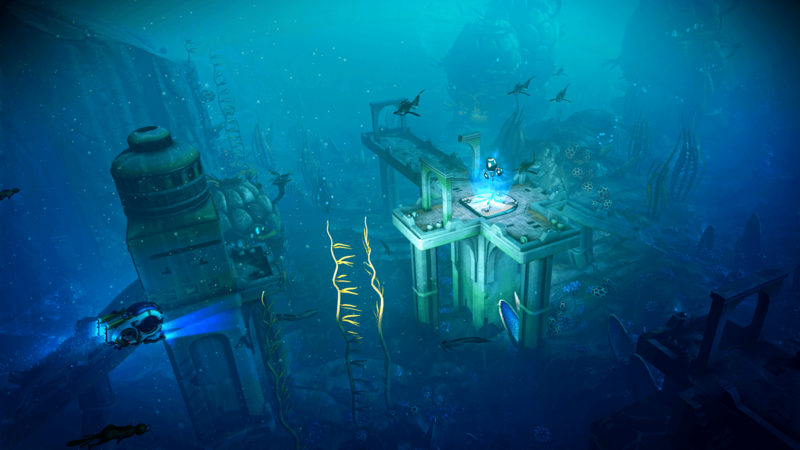 Explore oceans with new depth, filled with treasure and dangerous new life forms. Dive with friends, pilot a submarine around sunken wrecks and uncover a ghost story amongst buried treasure. 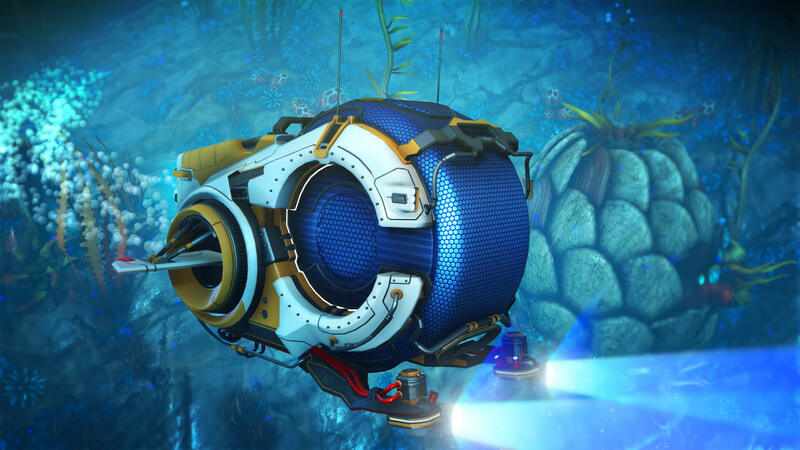 The post No Man’s Sky The Abyss Release appeared first on No Man's Sky. 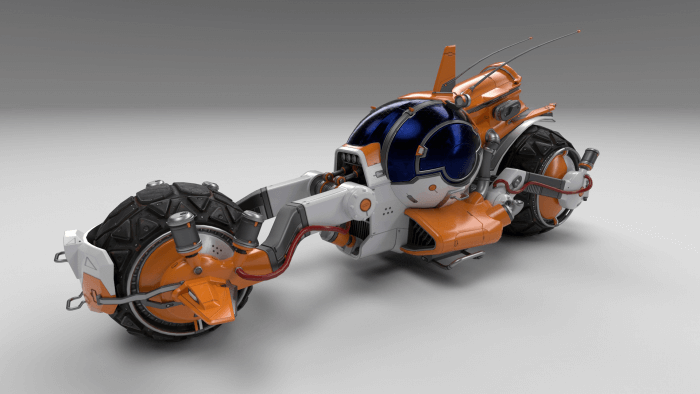 It’s been exciting to see the range of ways players have been exploring the features introduced in our exocraft update – from pushing the limits of the Pilgrim’s grip and suspension, to matching the colour schemes between bases and exocraft. Thank you so much for playing and for sharing. It really makes us feel like we’re on this journey together with all of you. Listening to you, the players, is an essential part of this journey for us. This week we are reaching out with a survey to discover more about what the community is most interested in seeing in No Man’s Sky. Please take this opportunity to have your voice heard! We hope you have been enjoying the most recent additions to the game with last week’s large update! The team here are concentrating hard on the upcoming features, but we continue to balance this with time dedicated to optimisation and ironing out issues that are important to players and to us. This week’s update addresses a few high priority issues and introduces the Space Anomaly’s next community research mission! Specialist Polo’s research has taken a new direction this week, after their analysis of the Sentinel data yielded some surprising results. The Sentinels are tracking other anomalous signals, signals currently unknown to Nada and Polo. Thank you for your feedback and kind words after our last development blog post. We hope to continue sending these updates for a little while. It’s nice to be at a point in time where we can share information and updates with the community. While some of us are also beginning to work on new features and content, the team continue to work hard making fixes. We listen intently to the community and appreciate the effort people go to in writing up bugs and feature requests. The response to our first community mission was great to see, and your feedback is being rolled into 1.59 and 1.6. It was also lovely to read all the messages left by explorers on the Community Research planet – so many notes sent from all across the world and broadcast all over the universe. We are continuing to address the highest priority stability issues reported by the community, as well as gameplay fixes and improvements. As always, thank you for playing the game and taking the time to report any issues you encounter! We have now released update 1.57 to PC, which includes the fixes detailed below. We’ll be rolling out these fixes to other platforms as soon as possible. We have now released update 1.55 to PC, PS4, and Xbox One, which includes the fixes and improvements detailed below. 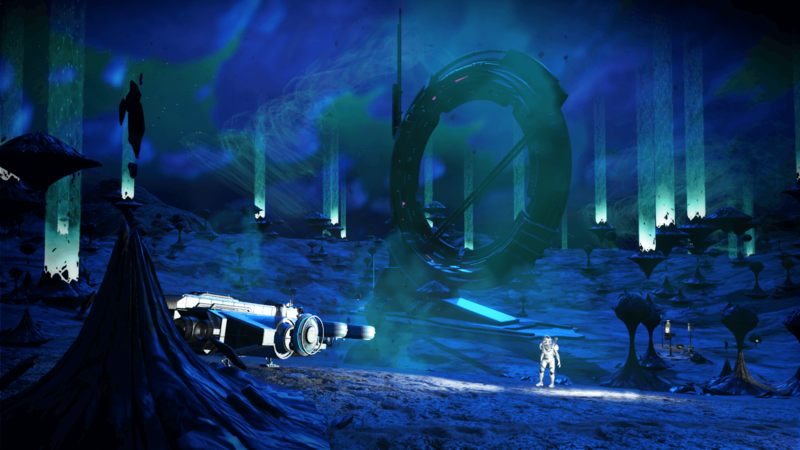 The post NEXT Patch 1.54 appeared first on No Man's Sky. We have now released update 1.53 to PC, which includes the fixes detailed below. We’ll be rolling out these fixes to other platforms as soon as possible. The post NEXT Patch 1.52.2 appeared first on No Man's Sky.